Picked up a 100 count box for $39 today as I can't seem to find any Remington 80gr PSP. Remington bullets are damned hard to get out here at the moment...I think the shortages in the USA have finally had an effect on our supplies. These bullets are Varmint bullets, but I am thinking that they will be suitable for everything from rabbits up to and including fallow deer. I expect them to expand quite dramatically when they hit so a neck shot on fallow would be the best option. I intend using Varget (my favourite powder) using a starting load of 34 gr and working up to a maximum of 37.5 gr. Does anybody have any experience with these bullets? Any advice? It's hard to say. Varmint bullets tend to be frangible for quick expansion/disintegration on light bodied animals for a quick kill. Without input from someone that has actually used them, I would be tempted to say that you might be disappointed. Then again, maybe at moderate velocities they may work just fine. They are listed as "Temporarily Suspended" on their web site. Thanks SSL...I am hoping that they will hold together long enough to do the job on fallow deer. If not, they should still be more than adequate for everything else I am likely to encounter, with the exception of pigs. Be good though if they turn out to be a good all round bullet. Vince, the Hornady 110gr BTHP is one of my go-to bullets for my 6.8mm. It is very accurrate - 28.6gr AA2200 with a mv or 2660 fps (BC 0.360). I've done terminal performance testing with it which may or may not translate to the experience you will have with a 6mm 87gr BTHP. The 110gr BTHP may have a hollow point (open tip) but this doesn't affect bullet expansion. This bullet yaws on contact then quickly breaks-up and fragments (I've found the HP tip still intact). The bullet does this reliably out to 300 yards - 2000 fps. I'm about to test it down to an 1800 fps velocity (400 yards) which I anticipate will be successful. The 110gr BTHP has been used for varmints and successfully on small deer for both neck and lung shots. Avoid the shoulder. Thanks Slim...that is pretty much what the guy at the Gun Shop said, but I take what they say with a grain of salt because they are trying to make a sale. I know I can trust you guys here. I can't wait to get some out on the range and do a little load development. I have used the 75 V-max in a .243 for Coyotes with Bang-flop performance on those critters. A good center hit will not have an exit wound and the insides are all jellied up. That bullet is not the same as yours but Hornady has always been a go to bullet for hunting. Vince, I've shot a lot of these in my 6MM. Loaded mine with IMR 4350 at 46 grains. Very accurate in my 6mm. Never used it on deer sized animals. Did take a lot of deer using the Hornady 87 gr. SP though, also with IMR 4350 powder. Good luck with yours. you beat me to it moose2..the 87grn sp is highly recommended by all for deer with a two for free!!! Slim thats interesting as I used the 110hp flat base in my .270 loaded down to about 3000fps and they were super explosive putting 1 litre sized holes in wallabies...just couldnt get a good group with them..good enough for 100 yards but didnt play with them enough to get better as got .223 by then. 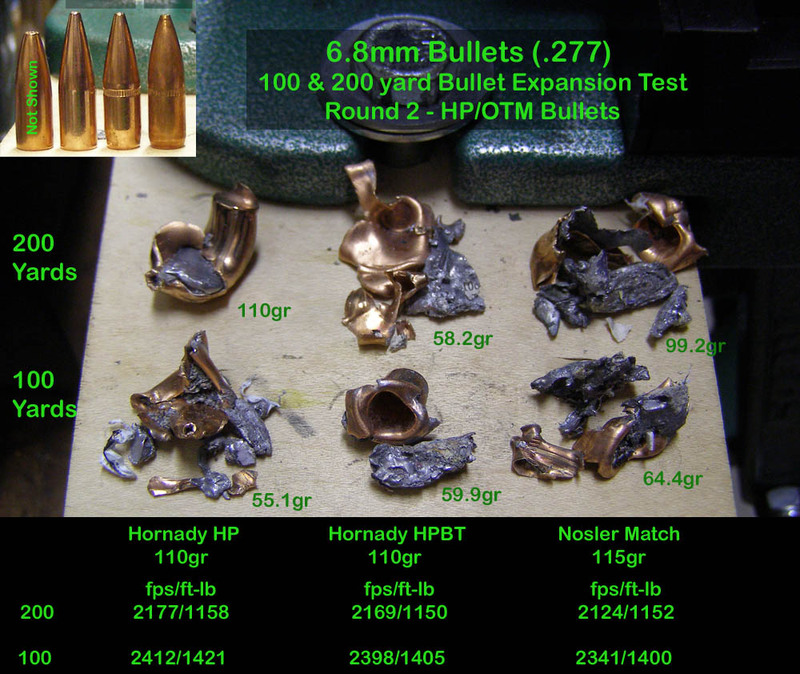 Elvis, the Hornady 110gr HP is different bullet and made for the .270. When the 110 HP is launched at slower speeds from a 6.8mm it turns into an ice pick. Here is some terminal performance testing I've done. The only HP I've gotten to expand from the HP opening is the Sierra 90gr HP which is a big wide hollow-point compared to OTM like the Hornady 110gr HP and BTHP. Here are some pictures. You can see the recovered 110 HP still has the tip intact in the 100 yard test. OTMs typically yaw and breaks up which still can be explosive. You can see at 200 yards the 110 HP doesn't break-up because it is made for the higher velocities of the 270. Caution - these loads worked in my rifle but this is no guarantee that they will work safely in yours. Outstanding info, but who's alice? Interesting question Bushy...I think she may be a sister to "Kate" (another strange poster) or Kate is Alice's alter ego and vice versa. Watching them both for evidence of SPAM. Another option is they are "somebody" watching us. interesting...they sure blew up too well for me!!!! maybe slower would have worked. Elvis, I believe 2300 fps is about the minimum velocity that the .277 110gr HP will still fragment. I'm about to test the .277 110gr BTHP which I think will be 1800 fps or less.